Rosewood is a free felted crochet bag pattern that uses hip and trendy color choices coupled with a handy pocket that can be on the inside or the outside. "What was that I just read?" That is right, this bag is reversible! Crocheted or worked in one piece, attaching the handles as you go along. Adjusting the width or length of the bag to fit your unique needs is easy. 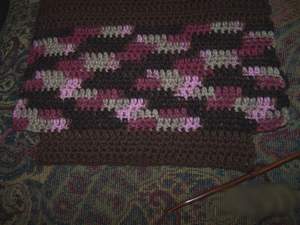 It is as simple as adding a few extra stitches in a row or adding a few rows. Really, you can custom fit this bag just for you. Like I said, this is a great bag for teens and on the go campus types. Also, choosing the handles can be a fun task! With so many choices from acrylic purse handles to bamboo purse handles or beaded purse handles this can be almost more fun than making the bag...almost. Oh, should I mention that it is a very fast project? If you are pressed for time this is the project for you! The whole bag from start to finish took me 9 hours to make. That means, if you start Rosewood in the morning, get it felted by night, you could have it ready to give as a gift by the next day! I ask you, what is better than that? You ready to make Rosewood? Your free felted crochet bag pattern awaits. If the stitch is worked in the front loop only (the loop closest to you) it leaves the back loop (the loop furthest from you) empty creating a ridge on the side of the work away from you. For this pattern, we will be picking up and working into the the ridge that was created to make the flap for the top of the bag. Just as it sounds, this is when you increase the number of stitches you are working with by putting more than one stitch in the stitch or space indicated by the pattern. Just as it sounds, this is when you decrease the number of stitches you are working with by joining together two or more stitches together with one stitch. Stitch the handle into place by wrapping the crocheted piece around the handle. Handle should be in place. *CH 2, turn. DC in each dc across. Repeat from * for next 4 rows. Change to color B, *CH 2, turn. DC in each dc across. Repeat from * for next 10 rows. Change to color A, *CH 2, turn. DC in each dc across. Repeat from * for next 11 rows. With color A, CH 5, DC into first dc of the base and in each dc across, CH 7, turn. Note this is going to be worked just like the other side so it will be the exact image of the other. With color A, *CH 2, turn. DC in each dc across. Repeat from * for next 11 rows. CH 2, turn. Decrease next two dc, DC in each next 32 dc, decrease next two dc. (34 dc). CH 2, turn. Decrease next two dc, DC in each next 30 dc, decrease next two dc. (32 dc). Change to color B, CH 2, turn. CH 2, turn. Decrease next two dc, DC in FLO of each next 28 dc, decrease next two dc. (30 dc). At this point you will have one long piece of crocheted fabric with a bamboo purse handle attached at one end. It is now time to attach the second handle. 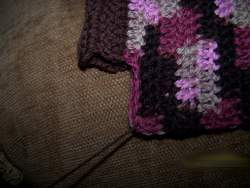 Just as you did the first, stitch the handle into place by wrapping the crocheted piece around the handle. If you followed the directions, you will have a free loop available to SL ST the wrapped crocheted piece. Fold the crocheted fabric in half with Public sides facing each other. Note all the color blocks should line up at this point. Using a SL ST Join, sew the sides together starting one row before the start of the first color B block. Leaving this gap between the handles and the seam will allow for your bag to open properly. When the sides of the bag are seamed up you will notice that you have to do a little something special to the bottom of the bag. At this point you will notice that your bag looks like this. You will need to flatten out the bottom so the sides of the base touch the sides of the bag. With your blunt tip needle whip stitch these together. It might be easier to look at the pictures. *CH 2, turn. DC in each dc across. Repeat from * for 12 rows. Using the blunt tip needle and color A stitch the pocket into the middle of the bag. Make sure that your ends is tucked away. It is a good idea to worked over your ends as you make the bag. That way there should not be too many ends to weave in later. Put your finished bag into a mesh laundry bag, making sure it's fastened shut. I like to use one that has a zipper. Or even a zipper pillowcase works really well. Now, just put your project into the machine, close the lid and wait while it does its magic. If you feel it hasn't felted enough, repeat the felting process without drying the bag first. When properly felted, for this particular bag, you shouldn't be able to distinguish individual stitches. To dry your bag, I used a book that fit the shape of the bag. 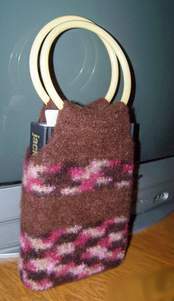 Place your bag in a safe place and allow your free felted crochet bag to air dry. 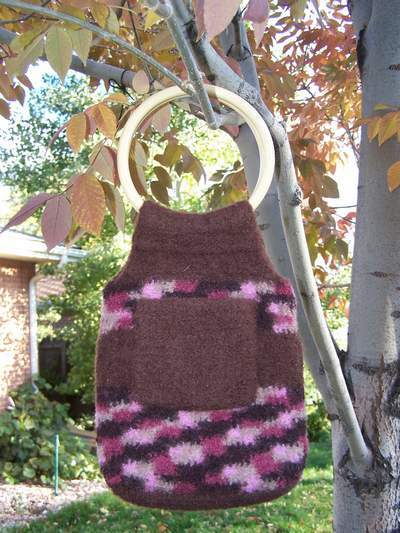 You have completed Rosewood, the free felted crochet bag pattern! If you like it, let others know about it, so they too can have one too! It always helps to remind them that the pattern!